2.) 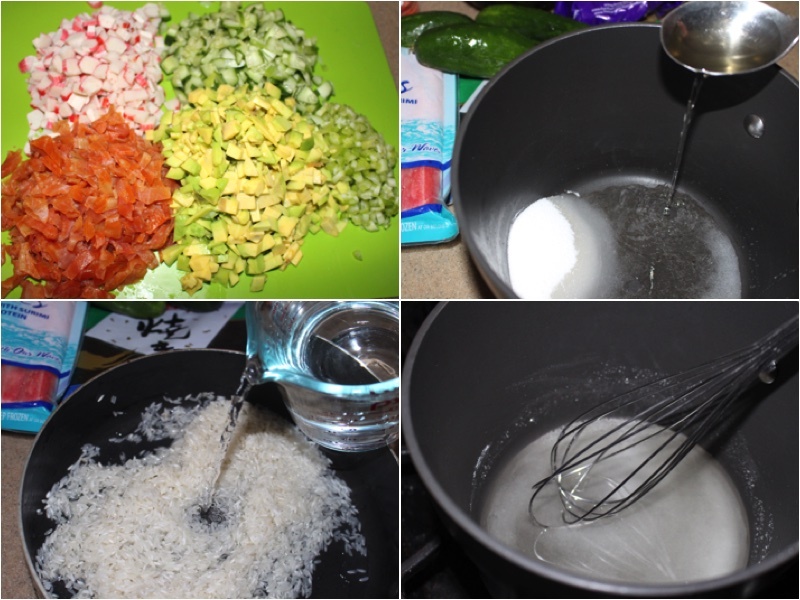 After rice cools down, pour vinegar mixture in and mix well. I made spicy mayo (5 drops of hot sauce and mayo mixed) and I used it as a sauce for the salad. If you like soy sauce you can use it instead of spicy mayo. We divided rice into 1/2 . 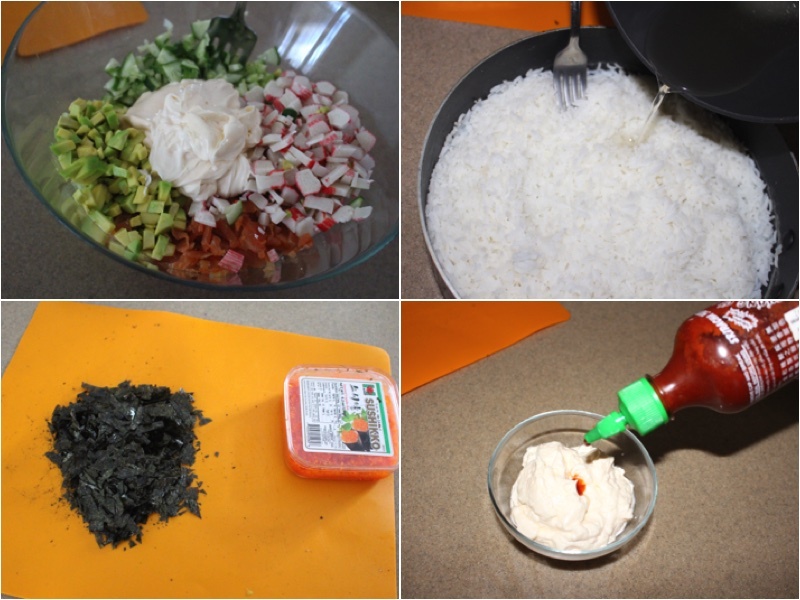 In a medium size bowl, I mixed all the ingredients as shown in the picture above with spicy mayo and half of the rice.As you see in the picture above in cut seaweed and it will be used for the sides of the salad. 3.) I placed the salad in a square shape on a plate, and covered it all with rice. 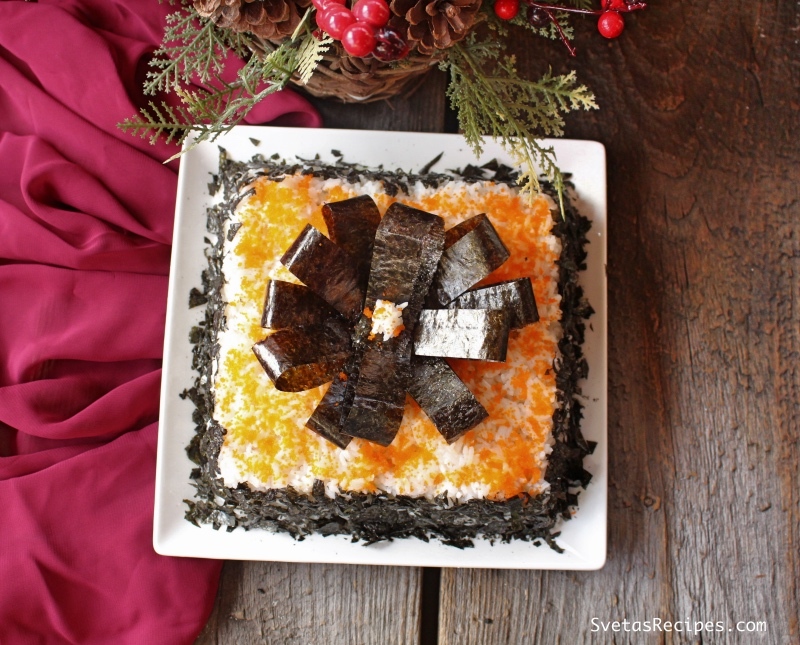 Then cover the top with sushikko and the sides with seaweed. After rice cools down, pour vinegar mixture in and mix well. I made spicy mayo (5 drops of hot sauce and mayo mixed) and I used it as a sauce for the salad. 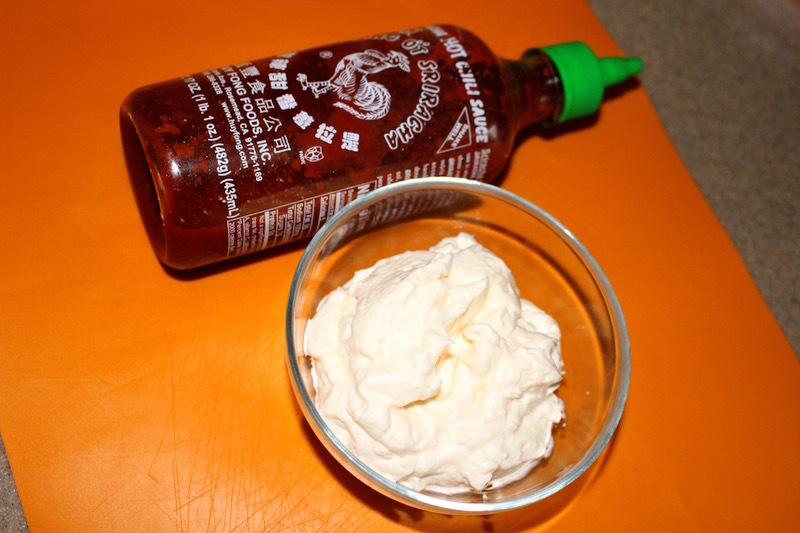 If you like soy sauce you can use it instead of spicy mayo. We divided rice into ½ . 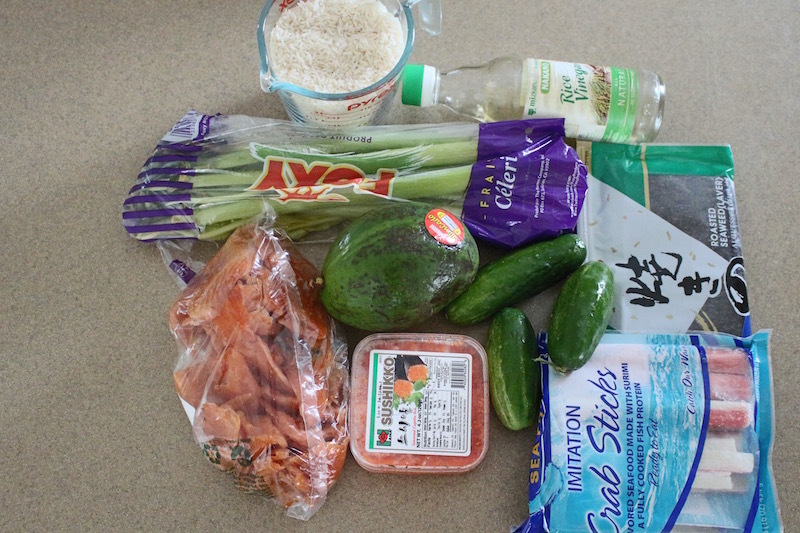 In a medium size bowl, I mixed all the ingredients as shown in the picture above with spicy mayo and half of the rice.As you see in the picture above in cut seaweed and it will be used for the sides of the salad. 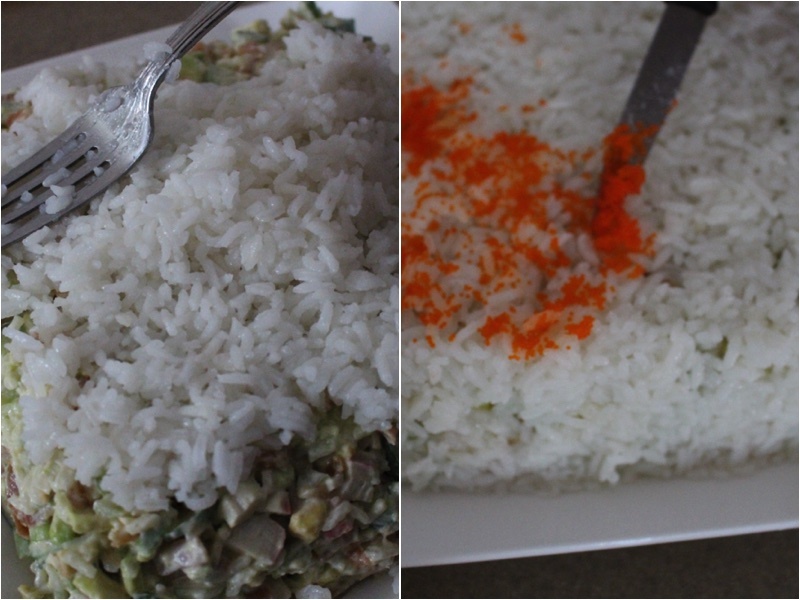 I placed the salad in a square shape on a plate, and covered it all with rice. 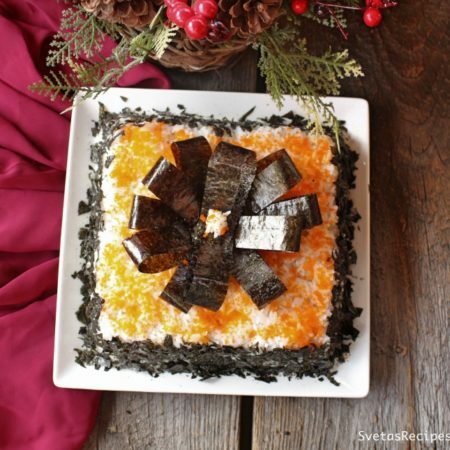 Then cover the top with sushikko and the sides with seaweed. Where do you buy sushikko? I bought sushikko from my local Chinese store. Where is that in Western MA area do you know? There is a Chinese or Asian store on Main St in Springfield MA, do not recall exact name of it. I also buy it at “A Dong Supermarket” in West Hartford area.